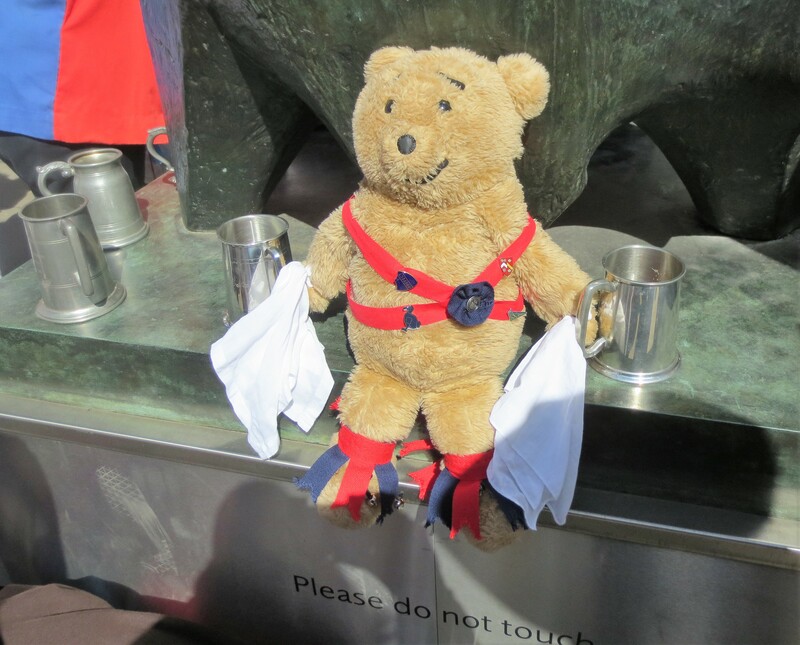 Morris Dancers wear ribbons with rosettes and have bells on the legs and wave hankies in the air while they dance. 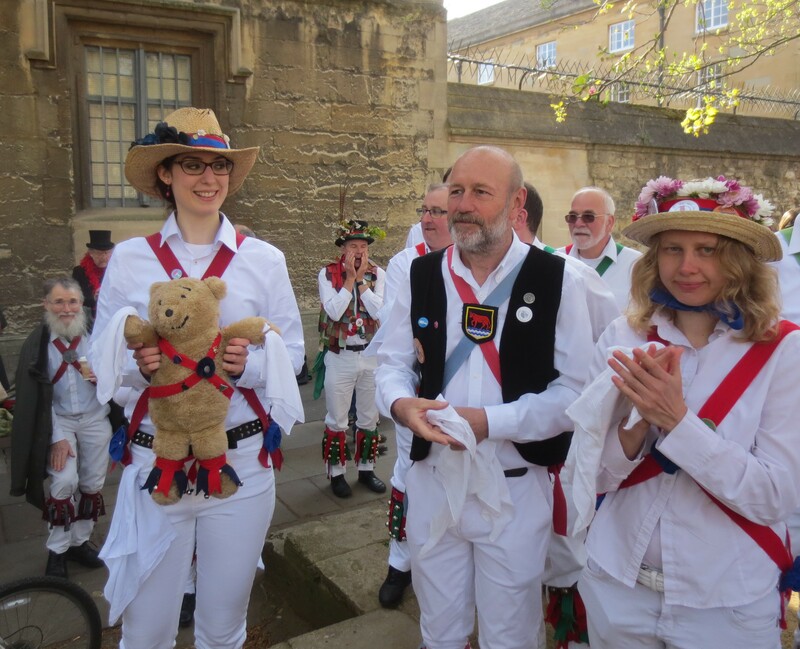 The first thing I had to do in order to have any chance of fitting in with Oxford Morris was to create an outfit a bit like theirs. 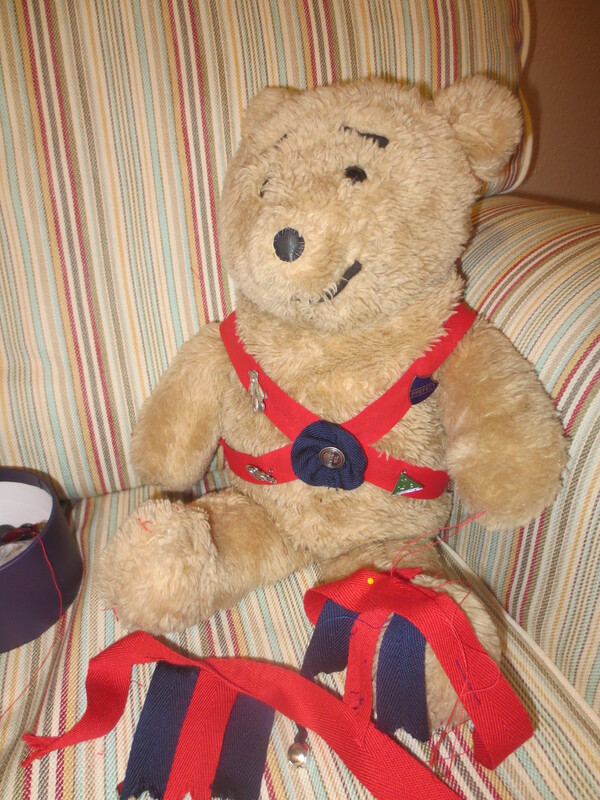 They call the straps around the body ‘baldricks’. 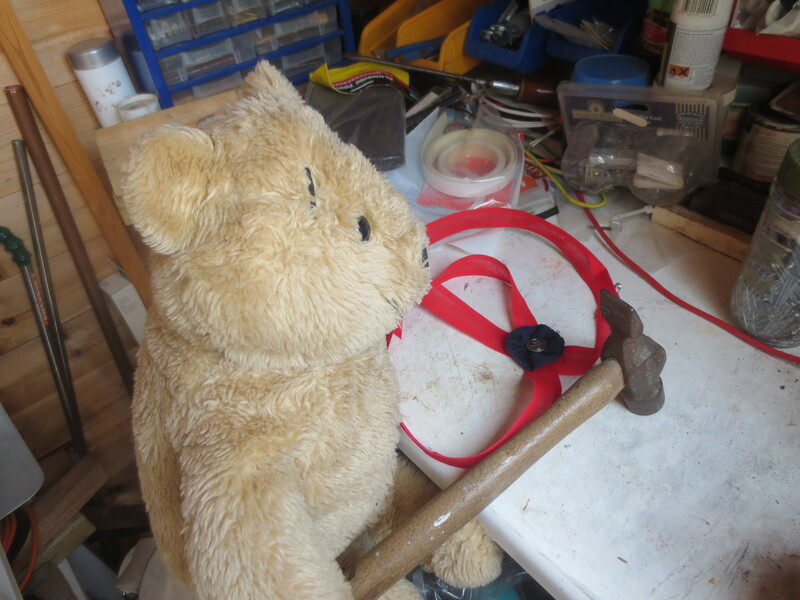 I had to go shopping to buy the materials, and found a shop that sold everything needed in St Nicks Market, Bristol. …and bells for my legs. 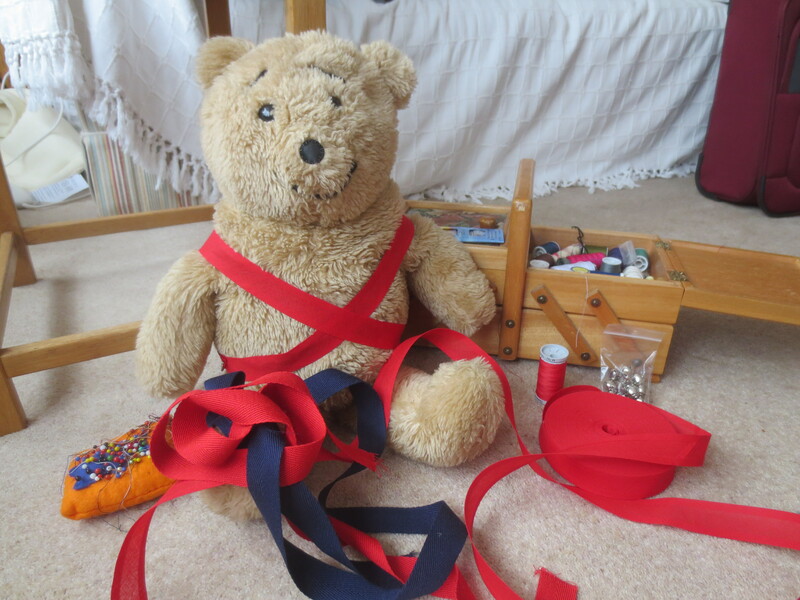 I set to work sewing, Hammering in the shed (I decided to use a stud that I found in the sewing box for the rosette) and I finally ended up with my Oxford University style Morris baldricks. 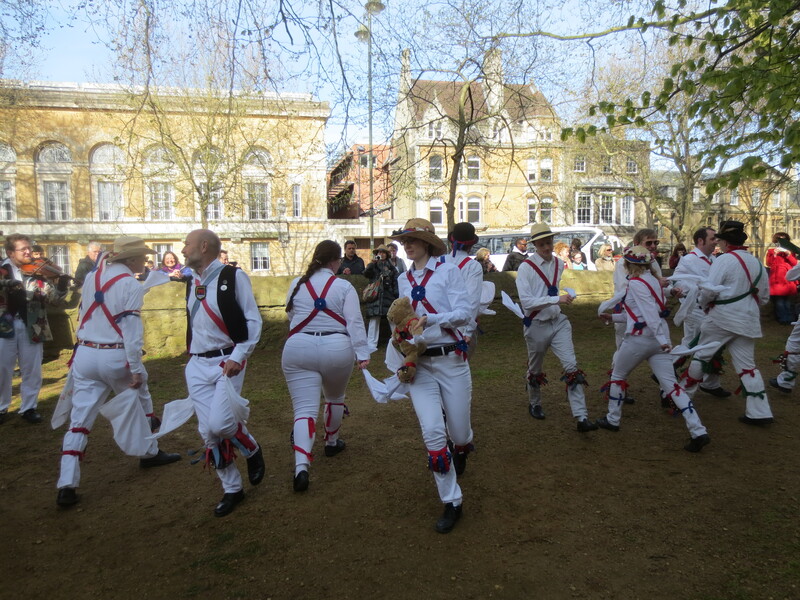 I had a little practice at home before setting off to Oxford to join in with the May Day celebrations. 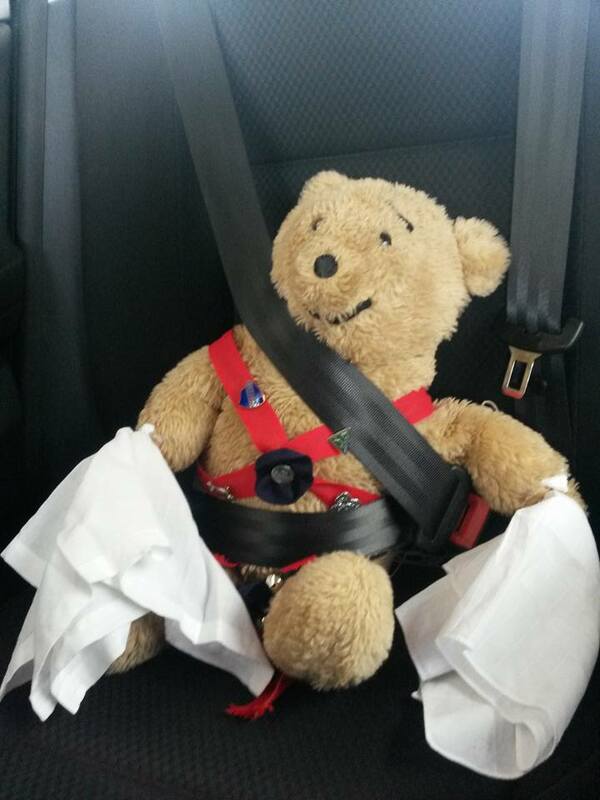 Then off I went to Oxford strapped into the back of the car wearing all the gear! We arrived at a very nice B & B – Lakeside Guesthouse, where rather conveniently there was a bed just for me in the room. 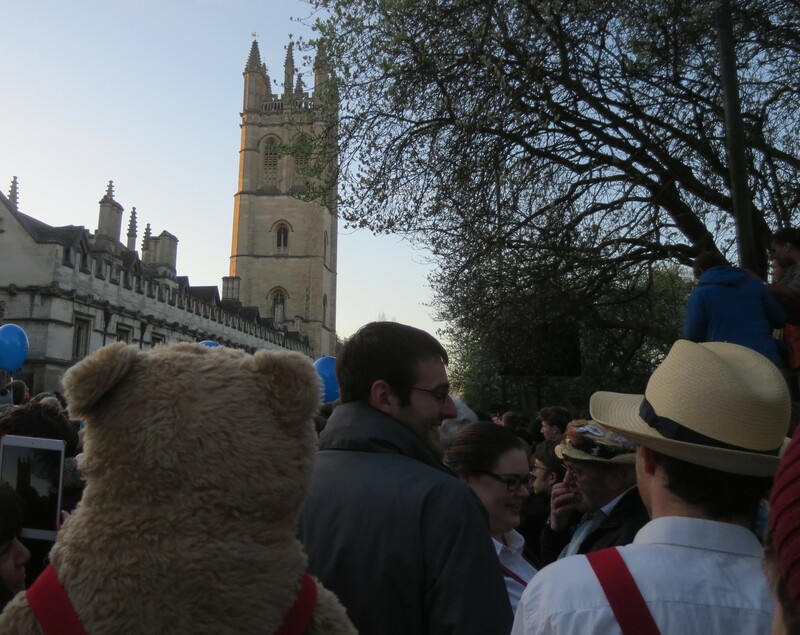 I spent the evening relaxing there as May Day celebrations start very early in Oxford. 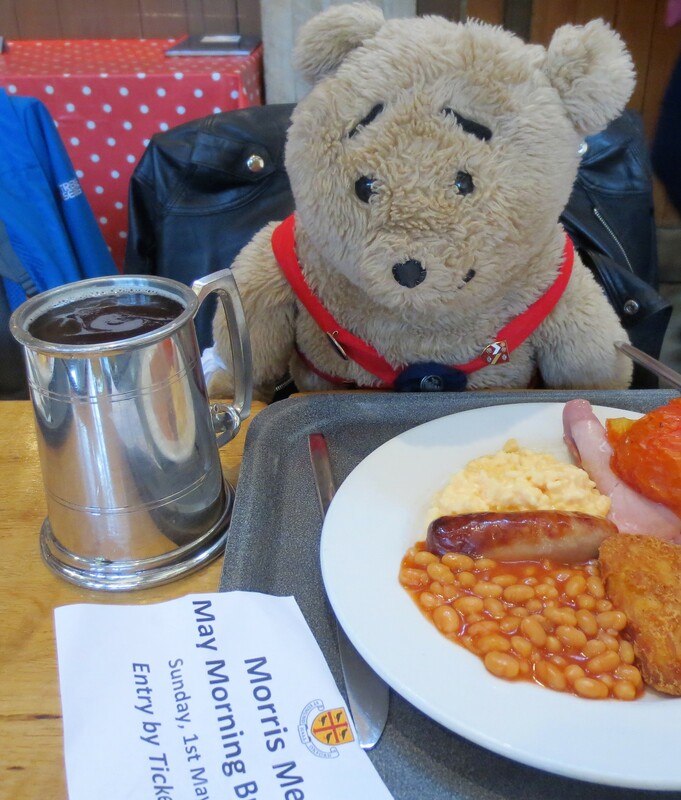 On May 1st 2016 and I got up very very early. 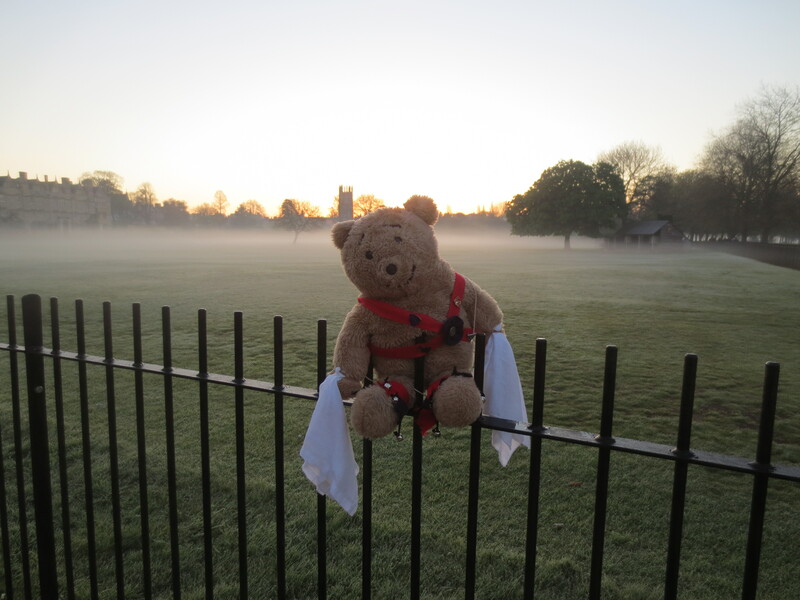 Here I am about to walk across Christchurch meadow… We were on our way to Magdalen Bridge to listen to the choir sing from the top of the tower at 6am. 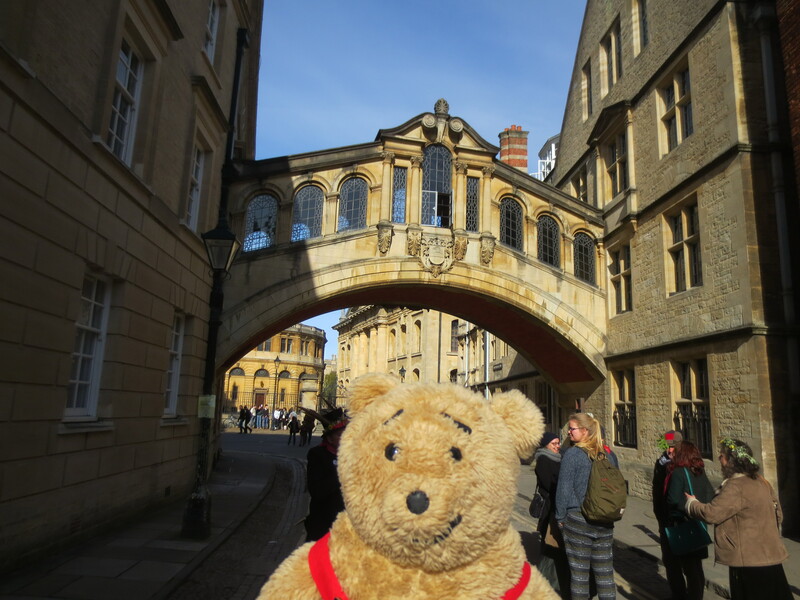 You can see the tower behind me in the distance in this photo…. 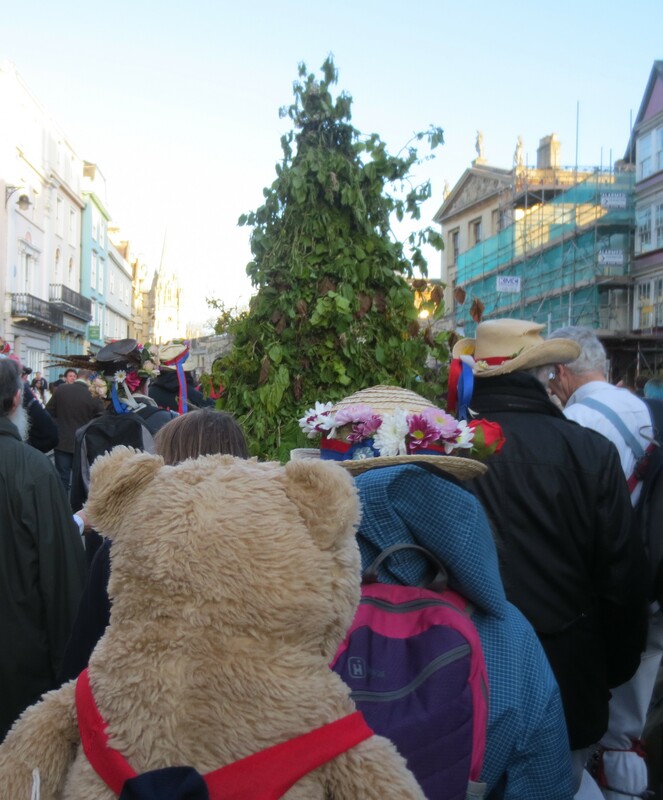 When we arrived at the bridge there were thousands of people there, including lots of Morris dancers and a tree, though I didn’t spot any other bears. At 6am the crowd went quiet and the sound of the choir filled the air. I could just about make out a few figures standing at the top of the tower. 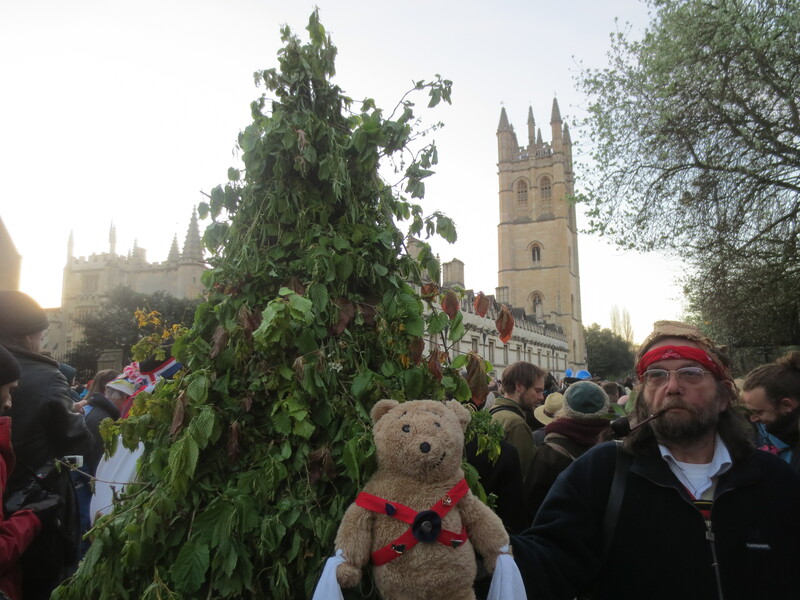 After the choir had finished singing, we all started to follow the tree as it walked up Magdalen St… The tree finally stopped at Radcliffe Square, and church bells started to chime. 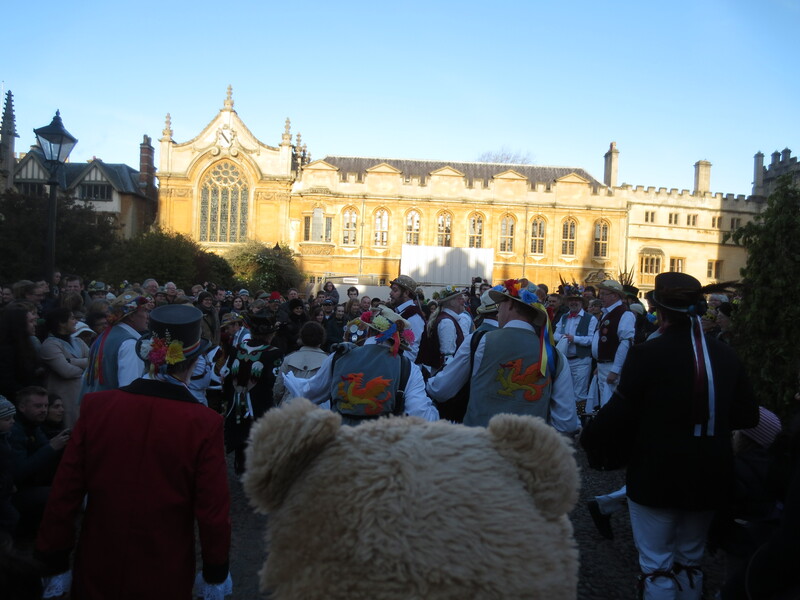 The Morris Dancers started to dance and play music. 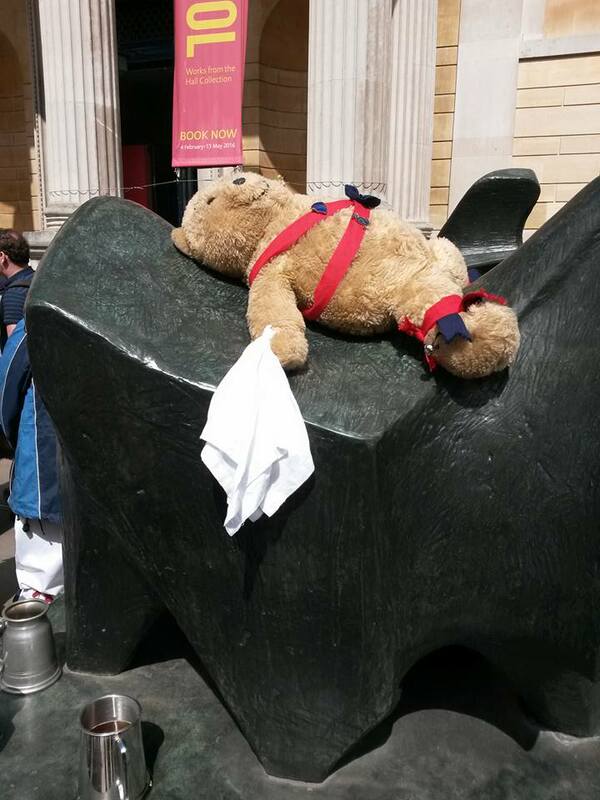 This entry was posted in Uncategorized and tagged alresford bear, May Day, Morris Dancing, Oxford, Oxford Morris by karenlovestodance. Bookmark the permalink. 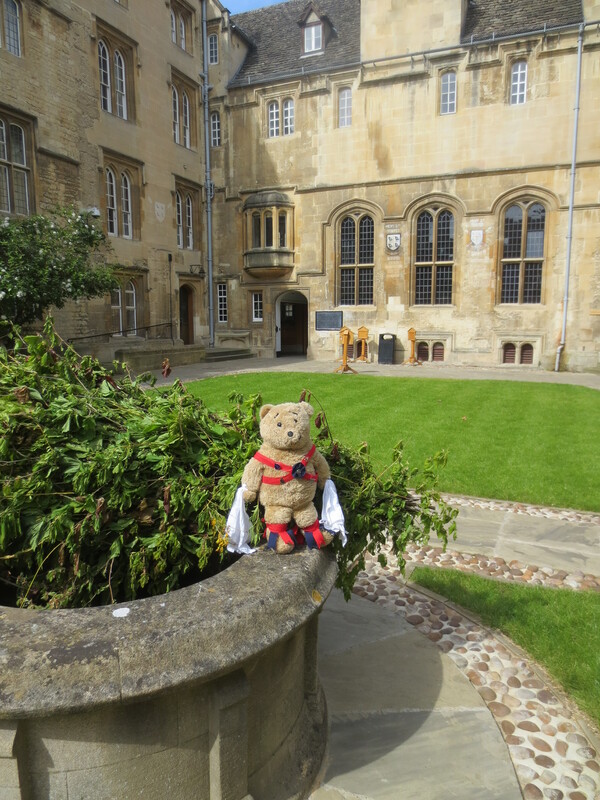 Tsk tsk — not St Edmunds College, but St Edmund Hall. Nice photos, though. This has made my day. 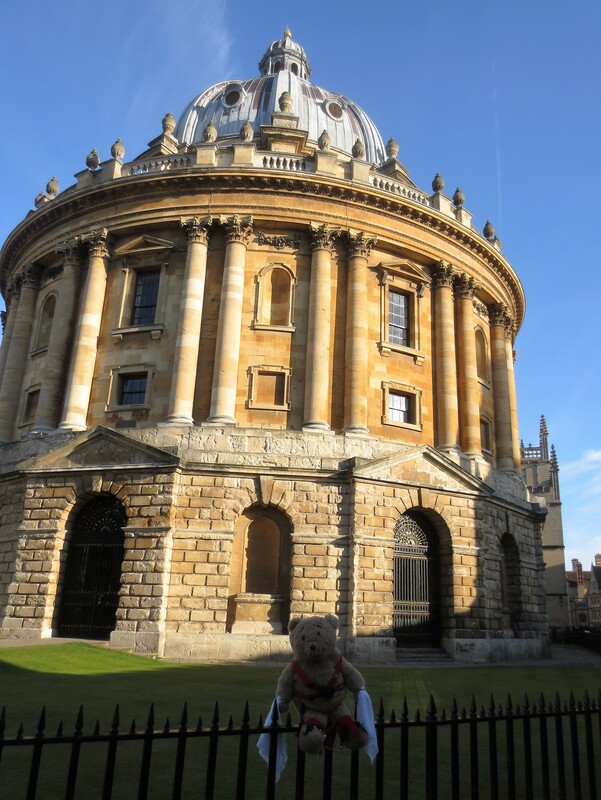 I was born in Oxford and I collect bears. So nice to meet Horace.love Susan. Am very impressed with your dancing Horace. 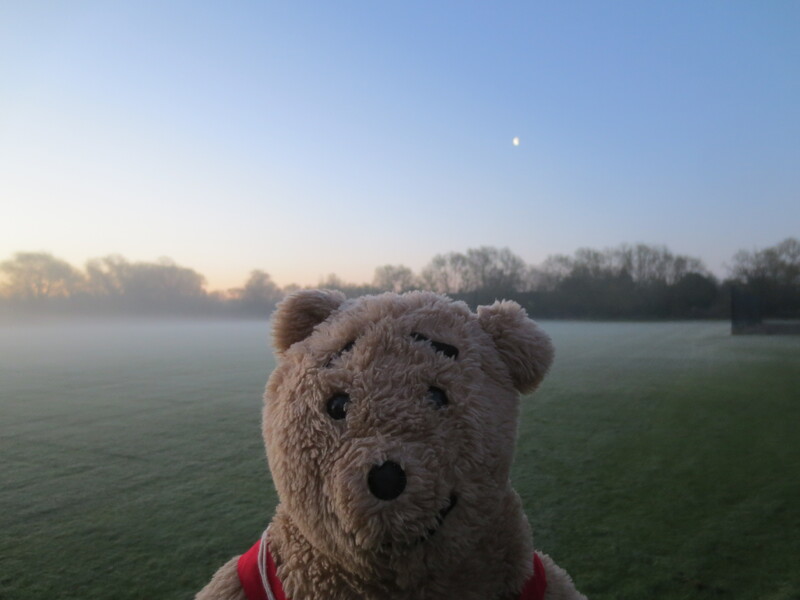 Alresford Bear sends you his warmest wishes. He spends his day looking out to sea and is envious of your adventures.